More earthquakes occur in Alaska than anywhere else in the United States. It's just one more cool and scary fact about the 49th state. In fact, Alaska can have up to 24,000 earthquakes in a year, according to the U.S. Seismology Department. 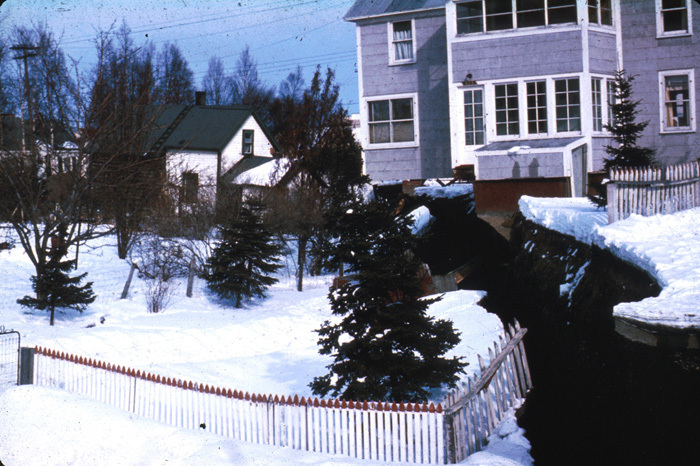 What makes Alaska so earthquake-prone? Alaska is in the lucky -- or not so lucky -- place where two major tectonic plates -- one continental and the other oceanic -- often bump into one another. These plates are giant slabs of rock just under the earth's surface. They float below the surface of the earth like chunks of ice in a frozen river. When they crash into each other, we feel it as earthquakes. 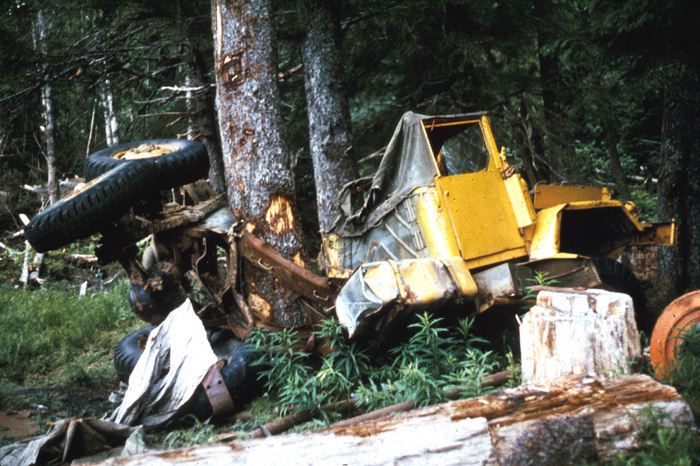 These crashes are reminders that the earth is still growing, especially here in Alaska. In Alaska, it is the North Pacific Plate and the North American Plate that fight with each other. Most of the conflict happens in Cook Inlet. Other activity happens north of Denali in the central Interior region. Most of the quakes in Alaska are not felt. But many are big enough to make people wonder if this is the next BIG ONE! And there is plenty of reason to think it could be. Every 13 years, on average, Alaska has a quake measuring at least 8.0 on the Richter scale. The Richter scale is a method of measuring the force of an earthquake. 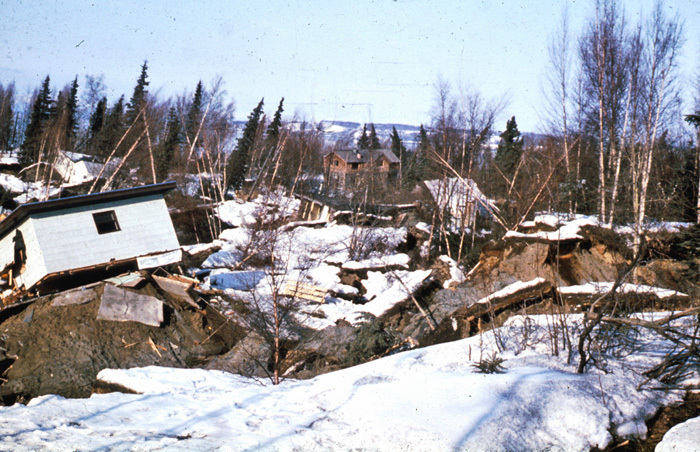 Three of the 10 largest earthquakes in the world have happened in Alaska. The second largest earthquake ever recorded in the world happened here. 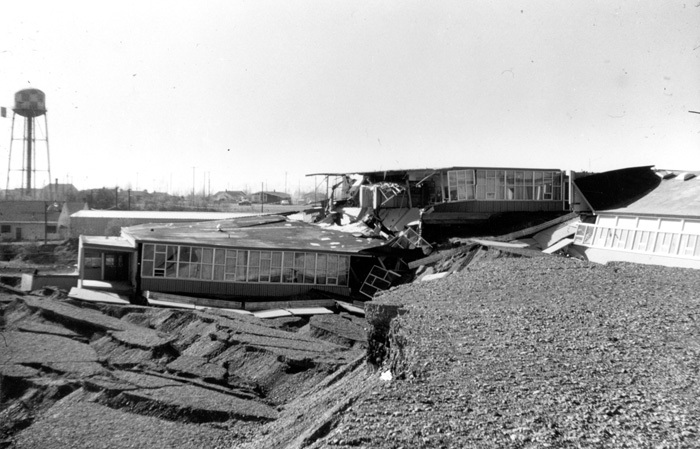 What has become known as the Good Friday Earthquake struck Alaska at 5:36 p.m. on March 27, 1964. At 9.2 on the Richter scale, the Good Friday quake released ten million times more energy than the atomic bomb that destroyed Hiroshima in World War II. The quake was centered in northern Prince William Sound. 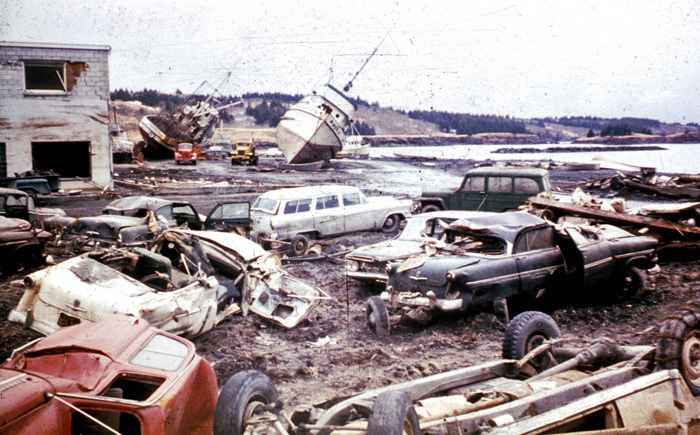 The jolt created a tsunami wave that killed 119 of the 131 people who died from the quake. Warnings stretched south all the way down the West Coast. Changes in water levels were noted around the world. In 2002, the 7.9 quake along the Denali fault in the Interior created gashes in Glenn Highway near Tok. This was the largest quake recorded in the world for that year and the largest quake ever to hit the Interior. Luckily, few people live in the area hit and there was little damage.